Apple Disk Utility allows to perform various management tasks on disks and disk volumes. Sparse disk image with .sparseimage file extension. Sparse disk image can grow on demand and only takes as much space as files inside it. Sparse bundle disk image with .sparsebundle file extension. Sparse bundle disk image is similar to sparse image but instead of one file it consists of a bundle of 8mb files. It takes as much size as content within it. Read/write disk image with .dmg file extension. DMG is a disk image file which preallocates entire disk size when created. Even if content inside DMG disk image is smaller than disk actual size, DMG file will still take full preallocated space. 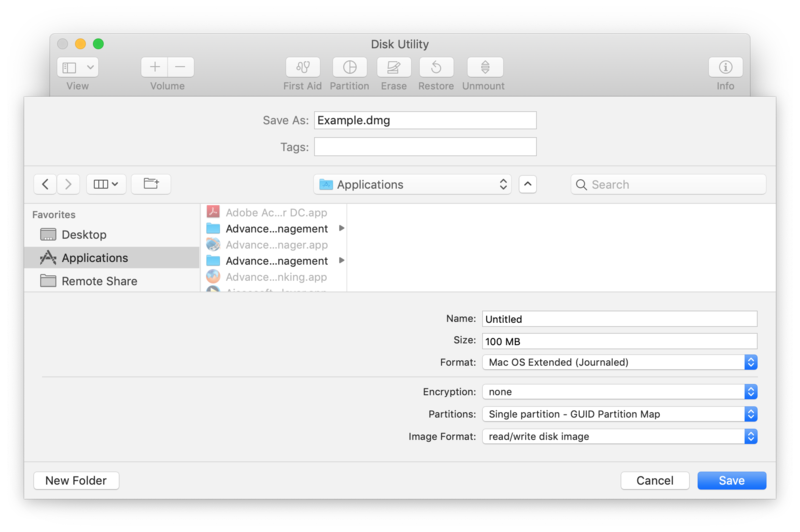 To create a new partition start Disk Utility and select File->New Image->Blank Image. You will see the following dialog. Select Image Format from the list above based on your needs. Choose file system that you want to use from the Format combo box. Good choices are either APFS (Apple File System) or Mac OS Extended (HFS+) since they have the best support on Apple devices. If you want to use your disk images on Windows it is better to choose exFAT or Microsoft NTFS. Verify that Size of the disk image you want to create matches your needs. You will still be able to expand your disk later if you need it but it is better to choose the right size when you create it since disk expansion or shrinking could be a time consuming process. Click on Save button and your image will be created. First Aid. Repair disk image or partition. Partition. Resize or create new partition. Erase. Remove all files from disk image and format it with selected file system. Restore. Restore content on disk image from selected volume. All content will be deleted during restore procedure. Create RAID with RAID assistant.